Le Breton Yachts additionally develops 24m superyacht SIG80 design – Superyachts News, Luxury Yachts, Charter & Yachts for Sale. The objective of the luxury yacht SIG80 is to combine outstanding performance with true luxury. 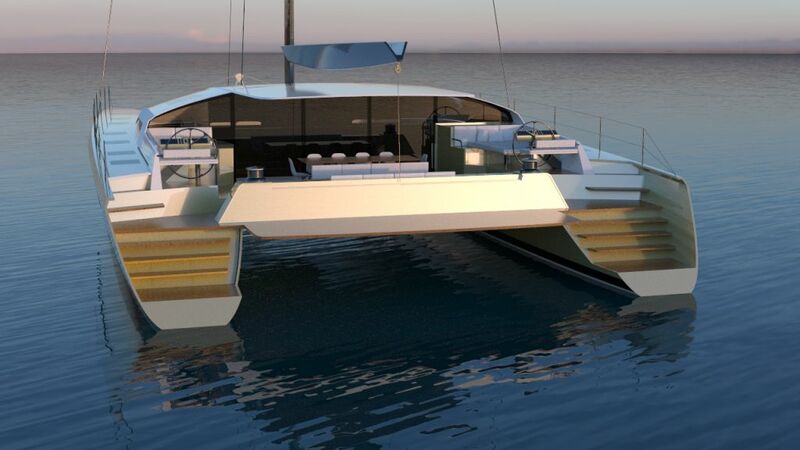 The speed potential of a well designed 80ft catamaran is enormous. With one important caveat: it must be light. Every additional kilo creates a speed penalty. By specifying modern composite materials in the hulls, rig and joinery, Le Breton Yachts has created a yacht that will outperform anything currently on the market, while providing a vast saloon, five cabins, four heads and crew quarters for three, including a small mess. The SIG80 yacht design has a number of unique features beyond its elegant lines. Sailing the boat will be exciting yet effortless and hugely enjoyable. Hydraulic systems will obviate the need for rope sheets and winches for most sailing manoeuvres, increasing safety and reducing sailing complexity. The steering positions provide the helmsman with 360 degree vision. Like a monohull’s helm station, the twin wheels are placed in a convivial cockpit, where the helmsman can be fully engaged with his or her guests. For all its luxury, the SIG80 superyacht will still be a “driver’s” boat. The accommodation layout provides an owner’s hull to starboard, with a private owner’s apartment aft and cabins for children or close friends forward. The design offers an optional cockpit entry to the owner’s aft cabin for additional privacy and practicality. In the port hull, there are two double en-suite guest cabins aft and a galley/crew mess and a twin cabin for the crew forward. Naturally, the SIG80 superyacht design can be customised to precisely meet a client’s requirements.